Good news to Tune Talk subscribers, it looks like Tune Talk is finally offering 4G LTE connectivity for you so you can surf up to ten times faster than you did before. Sadly, the telco did not mention anything about its 4G coverage. They are currently looking for people to test out their network, and are giving away free 4G-enabled SIM cards at their Twitter page. If you’re interested, visit their Twitter account and participate in their #TuneTalkHasLTEWeii contest and you will stand a chance to be one of the first to get 4G LTE speeds from Tune Talk. The telco did not mention anything about which LTE spectrum they will offer, but since they’re an MVNO from Celcom, they should ride on the same network. This means that all your LTE-enabled smartphones should be able to connect to its LTE network, yes, including your iPhone. 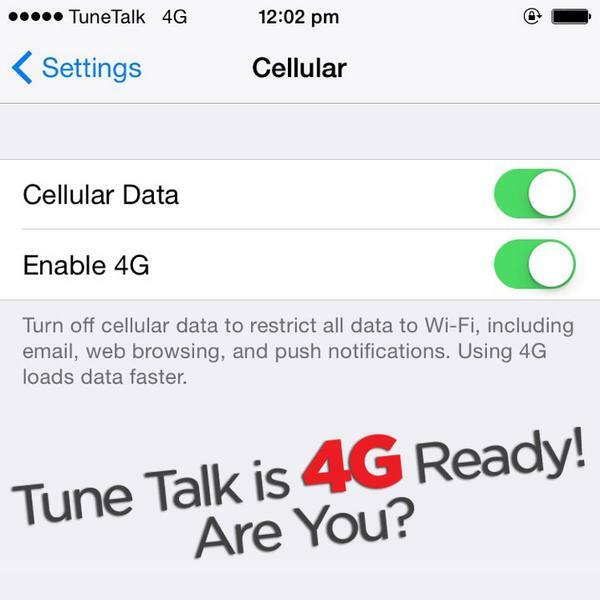 Tune Talk’s webpage has not been update to include coverage areas for its 4G LTE network. Visit Tune Talk’s Twitter page now to stand a chance to win a 4G SIM card from them. They’re currently giving away lots of SIM cards as we type.